The onion metaphor has often been used to describe the process of delving into a person’s psyche. Layers are removed to reveal what is beneath, toward the core. The metaphor reflects the many layers that we have inside us. Most who use this metaphor suggest that peeling away the layers of the onion is the complete story. The assumption seems to be that the awareness that happens as the layers of the onion are peeled away changes people. Is it the tears? Is it some magical healing factor that happens by exposing what was hidden to the light of day? Is it revealing the possibilities waiting for expression in the undamaged inner core? Certainly knowing what is within is useful, but usually insight alone is not enough to make real change and to sustain it. Something critical is missing from the mind-as-onion metaphor. What supposedly happens when these layers are removed? Some unknown aspect of ourselves is revealed; okay then what? It seems to me that the onion needs to be reconstructed and put back together, layer by layer, to be whole again. Putting the pieces together again, that is what’s missing! If we want to make it into something else entirely, such as salad, slices and layers scattered randomly around may be fine. But to be whole, the layers need to be re-placed or re-formed to complete what has essentially become a three dimensional puzzle. Have you ever tried to put a real onion back together? Not likely, but if so, how did that go for you? There is something about taking it apart that changes it. Perhaps that is the sometimes curative element of peeling away the layers of the onion; yet pieces themselves are not a whole. Let us consider what these layers are for the human mind-body system. These layers are meanings. They are meanings we make from our experiences, our thoughts, and our feelings. These layers are the emotions, possibilities, limitations, beliefs, and intentions that we developed and solidified inside ourselves through our experience. These layers are fundamentally meanings, often multifaceted meanings, which direct how we live our life and how we feel about our life. Just examining these does not necessarily enrich them, or us, in ways that are helpful or in ways that serve us. It is what we do with that information next that matters. In order to reconstruct the onion, to make it whole, changing the meanings of each layer and how they are stacked together is needed. Sometimes through our life experience the onion grew with the layers it needed to survive to deal with a lack of sunshine or too much rain. The way the layers formed may have served us then, but not now. Now the layers seem misplaced, out of place, malformed or just unhelpful! To make matters worse, sometimes the wrong layer is on top of another layer. The order of these layers matters, as it affects how we feel, how we function, what we think, and what we believe. In an onion the layers have a static relationship to each other, a specific layer belongs on top of or beneath another and that’s just the way it is. Fortunately our layers have more options! Our structure is not static. It is a malleable, and perhaps even magical, multidimensional puzzle of onion pieces that can be put together in a variety of ways. People have a natural tendency to feel that things are the way they are, often not realizing the strength and power they have to reconstruct the onion and become someone better and different, an enriched version of their former self. We are capable of true transformation! Changing the meaning is changing the layers; first by examining them, noticing them, acknowledging them, and then by questioning whether those meanings serve us. Changing the meaning is reconstructing each layer. Reconstructing is also deciding which layers go where. It is choosing which layers to honor and which ones are best discarded. Redesigning and improving ourselves is changing the nature of the layers and transforming them into something different, transforming the meanings. Then we can put the layers back together and reconstruct and revise and remap the layers. Through reflection you can see the layers of your deeper self and appreciate the possibilities of your higher self. Know that you are capable of choosing how to layer and organize all the pieces to create a whole that manifests your highest goals and best dreams! Who knows what will be the result. Perhaps what you will have at the end is not an onion at all, but something else, something more wonderful, a self transformed! This entry was posted in Enrichments, Mind, Mind-Body, Musings and tagged enrichment, neuro-semantics, personal growth, personal transformation, self-discovery, self-improvement, transformation. Bookmark the permalink. 4 Responses to Secrets of personal transformation: What’s missing from the mind-as-onion metaphor? Excellent analogy / metaphor – It could easily be trance-formed into a hypnotic induction, don’t you think? Yes absolutely! 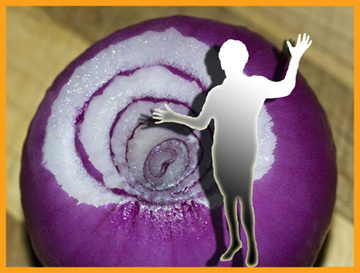 It could be a useful hypnotic induction to encourage unconscious participation in reconstructing the onion. It can also be used as a frame on a more conscious level to empower people to know they can transform their meanings, or change their meta-states, as in Neuro-Semantics. In my view both levels are important to address, both the deeper core self and the higher levels of self. Thanks for the comment Andrew! I loved the anology!!!!!! But,my favorite part was about putting the onion back together again! Thanks for the blog very inspiring!!!!!!! !